simplicities & serendipities: list fifteen: things i don't need but want anyway. list fifteen: things i don't need but want anyway. You know, sometimes I really wonder about myself. I mean, I have an amazing life filled with amazing people, a more-or-less worry free agenda, and sometimes I still find myself drooling over products with a too-high-for-my-budget price tag. Anyway, in an effort to get all this nonsense out, I figured I'd make a list out of it. Because that's what I do when things are all jumbled up in my brain. 1. Ray Bans. A fairly practical item, but I think my pair from Target is working out just fine. 2. Steve Madden Intyce boots. Because now that the winter season is over, Amazon has them listing for about $100 less than their original price. Still way too much but almost convinced myself that I needed them. 3. Clarisonic Mia. Since this is actually a practical item, I'm not going to get mad at myself. Still, pricey. 5. A trip to Denmark with Jeffrey. HA HA, that's a funny joke. 6. This dress. But really, who wouldn't want this? Okay, that feels better. I'm done being materialistic for the day. Maybe I'll go frolic in a beautiful field tomorrow just to make up for the superficiality of this post. Any big ticket items you'd like to buy? xo, R.
Beautiful photo of Denmark found here. 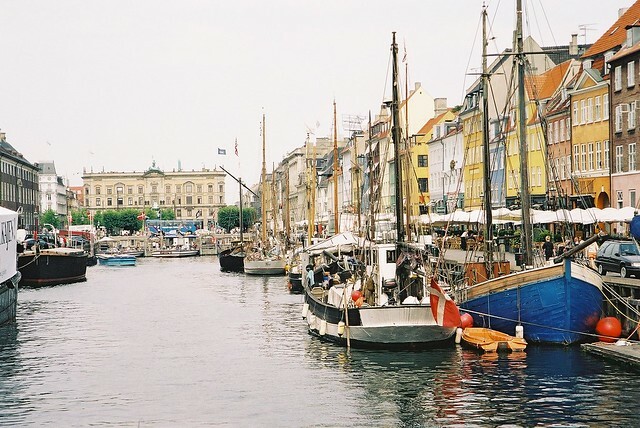 and a trip to denmark sounds fab! My husbands family is from there and I think we may head up there this summer when we're in Suisse. I really do think I'll get a clarisonic when I start working again this summer. I've heard so many great things about it. I hope you and JB get the chance to go to Denmark! It was voted the happiest country in the world, which is where some of my attraction to it comes from (among other things). If you go though, promise to take loads of pictures! The guy that went to Prague with us is from Denmark! Not that I want to encourage unnecessary spending either, buuut I recently bought a pair of Doc Martens, because my boots from Goodwill finally bit the dust, and I had been wanting to venture into that store for quite some time, since one of the what, only like 5 stores in the world, is located in San Francisco. They were way out of my budget, but I convinced myself I needed them, because it's been raining a lot here and my toes are always cold in my other shoes, and I don't own many shoes that can stand up to the rain. Let me tell you, rain or shine, I have worn these boots SO MUCH! It was a great investment. I read about Denmark being the happiest country, and that made me want to go too! i totalllly want the mia. if you do end up getting it some day, can you pretty please tell the rest of us all your thoughts on wether or not it's worth the moolah? also... really liking the blog! some how a breath of fresh air in the blogging world... maybe it's the small font. Megan - that is so cool! Becca - I will probably purchase the Mia as soon as I get my first paycheck this summer. When I do, I'll certainly give you my feedback! Bon Bon - I totally feel ya! I mean, thinking back on all the sunglasses I've broken makes me feel very hesitant to buy some more expensive ones. I would hope that I might feel a little more responsible with them knowing that they cost me a little more. But yes, I totally agree and will definitely need to think about it before purchasing!